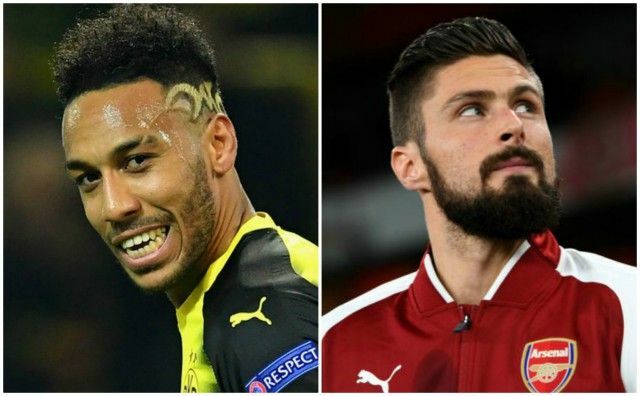 Arsenal are reportedly hopeful of wrapping up the signing of Pierre-Emerick Aubameyang, but Olivier Giroud’s future could be crucial in getting the deal over the line. As per Sky Sports, Aubameyang is at the club’s training ground ahead of completing a £60m move to join the Gunners to significantly bolster their attacking options. Given the level of creativity and goals within a group containing the 28-year-old along with Mesut Ozil, Henrikh Mkhitaryan and Alexandre Lacazette, it’s would come as no surprise that Arsenal fans are itching for the transfer to be officially confirmed. Losing Alexis Sanchez was undoubtedly a blow for them, but ultimately filling that void with Mkhitaryan and Aubameyang arguably makes them a better side. However, as per BBC journalist David Ornstein, as seen in his tweet below, Chelsea are unwilling to meet Arsenal’s £20m demands for Giroud, which could scupper the whole transfer merry-go-round that also involves Michy Batshuayi. Essentially, Giroud moving to either Stamford Bridge or Dortmund will unlock Aubameyang’s deal to sign for Arsenal, and based on the above claim, the Blues could make life difficult for their rivals which threatens to see their entire transfer strategy collapse if Aubameyang isn’t allowed to leave. A conflicting report has since emerged though, with The Guardian reporting that Giroud is now set to sign for Chelsea in a deal worth £17.5m, and so it remains to be seen whether or not that speeds everything up with the Wednesday transfer deadline fast approaching. It’s questionable as to whether selling Giroud is a smart idea given he offers a completely different option up front with his physicality, aerial prowess and ability to help build attacks. However, if sacrificing him means that Arsenal can sign Aubameyang, that’s surely a deal that many fans would back given his prolific goalscoring record in Germany.